Western blot analysis of PANC-1, SW620, and 293T cells using PYCR1 Antibody. Immunoprecipitation of PYCR1 from Hep G2 extracts. Lane 1 is 10% input, lane 2 is Normal Rabbit IgG #2729, and lane 3 is PYCR1 Antibody. 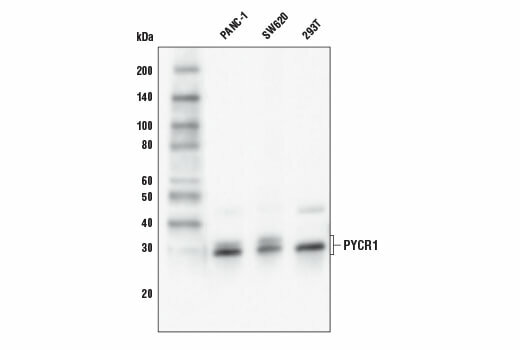 Western blot analysis was performed using PYCR1 Antibody. 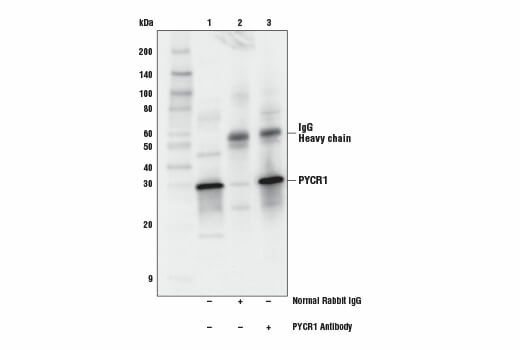 Anti-rabbit IgG, HRP-linked Antibody #7074 was used as the secondary antibody. PYCR1 Antibody recognizes endogenous levels of total PYCR1 protein. Polyclonal antibodies are produced by immunizing animals with a synthetic peptide corresponding to residues near the carboxy terminus of human PYCR1 protein. Antibodies are purified by protein A and peptide affinity chromatography. Mitochondrial pyrroline-5-carboxylate reductase 1 (PYCR1) catalyzes the last step in proline biosynthesis (1). Research studies show that proline is a limiting amino acid to clear cell renal cell carcinoma (ccRCC). PYCR1 expression is induced in kidney cancer cells to compensate for the proline shortage and maintain cancer cell growth. Furthermore, PYCR1 knockdown inhibits ccRCC cell proliferation in the absence of proline, suggesting this enzyme as a potential cancer therapeutic target (2). In addition, breast cancer cells also express high levels of PYCR1 (2,3). Proline is restrictive to invasive ductal breast carcinoma cells, indicating proline vulnerability in the breast cancer formation (2). Christensen, E.M. et al. (2017) J Biol Chem 292, 7233-43. Loayza-Puch, F. et al. (2016) Nature 530, 490-4. Possemato, R. et al. (2011) Nature 476, 346-50.